I see a system that doesn’t understand how White brains in America are biased against people of color. I’m on a cascading post thing here. First was Rachel Cargle on Wednesday’s gratitude post, then came yesterday’s look at data on race and ethnicity in our local school system. Today, as promised, I’d like to dig into what we can learn from all those numbers. Let’s start with access to gifted and talented resources. 18 out of every 100 White kids were identified as gifted compared to less than 5 out of every 100 Black kids. I’m hard pressed to find a clearer example of privilege giving White kids a foot up from the very beginning. A friend brought socioeconomic status into the mix yesterday, and he’s absolutely right. These issues are intersectional – a financially secure Black child will sidestep certain obstacles a poor Black child faces, but there’s a unacknowledged baseline issue in our country. If you put two children with the same economic status side by side, one White and one Black, they are not treated the same. Not because a teacher looks at the Black child with hatred in his/her heart but because we live and breathe a White dominant culture every day and that has side effects. But that’s a post for another day. Let’s talk proportionality. 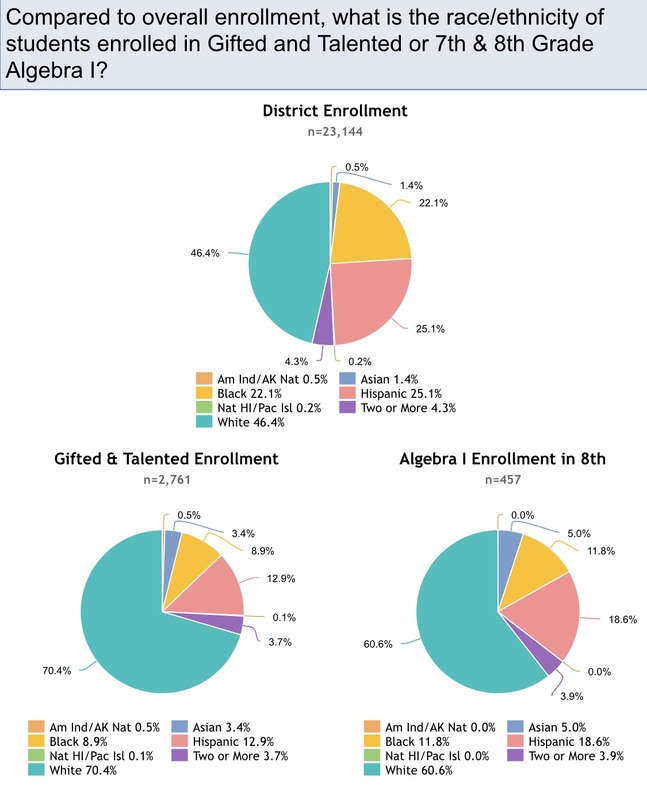 1,944 gifted White students is 18% of the total White population. 246 gifted Black kids is less than 5% of the total Black population. Crunch the numbers and that means White kids were 360% more likely to be identified as gifted. Even accounting for a racial disparity in poverty, I think we can agree that 360% is an absurdly biased spread. And we haven’t even begun to explore the domino effect. Early access to accelerated classes leads to extracurricular educational opportunities leads to an advanced track in middle school, more A.P. classes in high school, and a wider selection for higher education which leads to better career opportunities…and the beat goes on. Yes, it can all start with an elementary school gifted program. The visual from these pie charts was the first thing that hit home. Compared to District Enrollment: For ISS the White student section shrank a tiny bit while the Black student section grew larger. For OSS the White student section shrank even more while the Black student section grew larger still. By the time we get to Expulsions all other colors have disappeared. All four students who were expelled that year were Black. How do you suppose it gets to the point where an ethnic group makes up only 22.1% of the population but 36.3% of ISS and 40.8% of OSS? 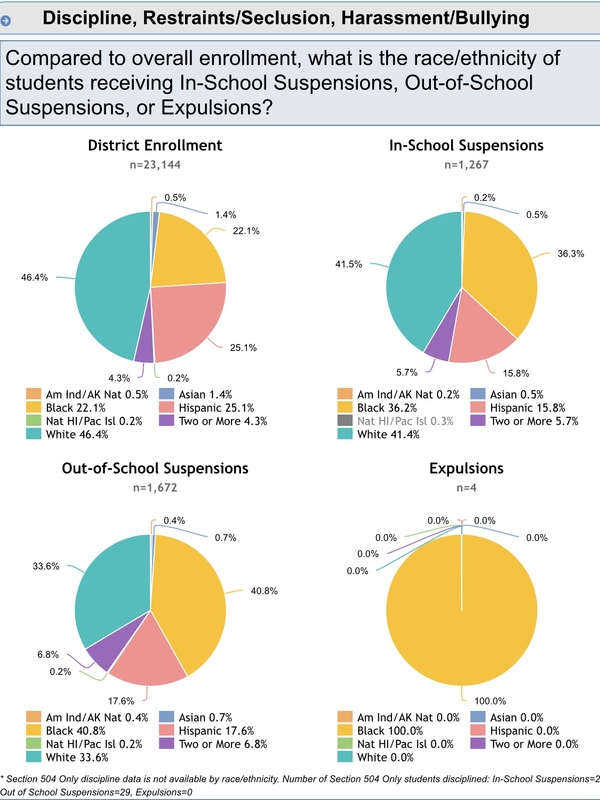 Do you think it’s because that many more Black students are breaking the rules? It turns out not only were Black kids 360% less likely to be identified as gifted, they were also 260% more likely to be suspended out-of-school. Some people see that and say yeah, they’re not gifted, they’re less inclined to succeed in school, so why wouldn’t Black kids be disciplined at higher rates? Here’s what I see. I see a system that doesn’t understand how White brains in America are biased against people of color. I see it when five kids have their phones in class but the Black one gets called out. When several kids stop at the water fountain between classes but the Black one gets yelled at for it. When the White student who cheats has his parents called in for a conference but the Black student gets detention for being disrespectful to the teacher. There’s a reason that yellow piece of the pie keeps growing larger, and it’s not because Black children misbehave more. It’s because our prejudice teaches us to judge Black students more harshly, label them more quickly, and punish them more severely. We are the problem here. Next Next post: SoCS – but it’s traffic. going in a circle. what the hell’s a “roundabout”? As I said prior, economics are also racist, soo… even if it were completely based on that, no dice. But it’s not, it’s exactly how you say it is. It surely is one clusterf*ck of a mess, isn’t it. The numbers are alarming, and they are not supported by other facts. This is little more than having separate education within an “integrated” building. These same patterns follow these kids, and women, into the workplace, where wage rates and opportunities for advancement are dolled out in a similarly skewed fashion. Yes, yes, yes — all of this! It is separate but not equal, & the spillover builds for years. Your sentence is ‘I see a system that doesn’t understand how White brains in America are biased against people of color’. – is it not the whites who don’t want to admit that as individuals? Then they lose an advantage. I just keep thinking of 3/5. The difficulty is the cognitive biases that come into play when these issues are raised. Ie people hunker down and believe things they already did more when they are told. Which beggars belief. Knowledge of cognitive biases will eventually filter through and inform how the debate is approached. Not to mention american Indians ,which don’t even make the debate. You’re absolutely right, it is the whites who refuse to admit this truth to themselves and to each other. And since we have all the power, we (whites) have no incentive to change a system that is working so well for us. It’s an infuriating circle. I hope by talking about it I can expose more people to the concept that there *are* cognitive biases, EVEN in “good” people who “hate racism.” And yes, all people of color are disadvantaged in this system. We need to do better. Thanks for reading and sharing your thoughts. Yo, this is what allyship looks like. Keep breaking it down for folks. At my daughter’s old school I *had* to advocate for every little thing because it was so obvious that the system is designed the way it does: to uphold white supremacy. Folks don’t want to admit it, but the numbers tell the story. Thank you (but — as Rachel C. says — I don’t get a cookie for doing the right thing). You’re right, white folks don’t want to admit their success is due more to a rigged system than their industrious hard work and natural talent.